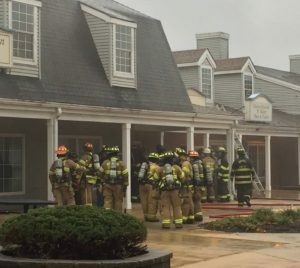 On Sunday afternoon, October 29th, at approximately 3:30 p.m., officers from the Manchester Township Police Department responded to 108 Lacey Road, the location of Whiting Shopping Center, for an active fire alarm. 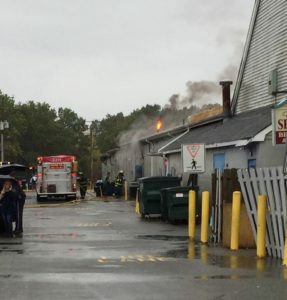 Upon arrival, officers reported seeing black smoke coming from the roof area in the rear of the complex. Firefighters responded and located an active fire in a vacant unit within the back section of the shopping center. The fire involved one wall and extended up into the attic space. The involved unit sustained fire, water, and smoke damage as did the adjoining unit belonging to Charles Edwards “A” Salon. This was the second fire in this same unit over the last month. 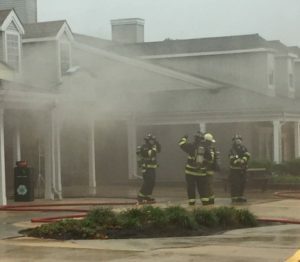 Firefighters from the Whiting, Manchester, Ridgeway and Lakehurst Borough Volunteer Fire Departments responded as did firefighters from the Joint Base-New Jersey to assist with the suppression and overhaul operations. The fire is considered suspicious and is being investigated by Ptl. Juralewicz of the Manchester Township Police Department with the assistance of members of the Ocean County Prosecutor’s Office, Ocean County Fire Marshal’s Office and the Ocean County Sheriff’s Office Crime Scene Investigations Unit. Anyone with information regarding this incident is asked to contact Ptl. Matthew Juralewicz at 732-657-2009, ext. 6371. 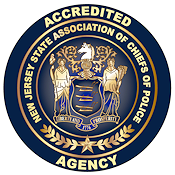 Additionally, anonymous information can be submitted through the “Tipline” link on our department website at, www.ManchesterPoliceNJ.com.